I was rich as a child. Just kidding. I wasn’t. I lived in humble conditions in subsidized housing. My family was so poor we used the residual heat from cooking to heat our home. I had to share a room with my brother. I didn’t get a puppy. We only had one car, and it didn’t even have air conditioning! And worst of all, I didn’t have a Wii. Now granted the subsidized housing was married student housing since my dad was still in PhD school when I was born. It was a cheerful, happy community with dozens of kids my own age. We did use heat from cooking to heat the house, but so what, why not? I never minded sharing a room with my brother – I assumed that’s how brothers were supposed to live! I didn’t get a puppy because I never really wanted one. We only needed one car because everything was close by, and most cars didn’t have air conditioning back then. And although I didn’t get a Wii, I did get a computer when I was 10 – a Tandy Color Computer – because my parents thought learning some computer skills could be useful if it ever managed to evolve into a useful device. Too bad computers never really took off, eh? One of the memes of my financial life has been to proudly point out how my parents rose above their parents financially, and how I was rising above them (at least in terms of income – in terms of real long-term wealth they are still way ahead of me). This meme was always painted a massive struggle against near-impossible odds – primarily due to my big brain. I have been fond of telling people how I didn’t always have the big house and the big cars and the bling bling (does anyone still say that with a straight face)? I made it on my own! I never had STUFF! We lived in a SMALL PLACE! We struggled! We succeeded in the face of a harsh, cold world! I got carried away again. It’s true that I didn’t have a lot of stuff growing up. Having a small apartment for four people restricts storage space. We never really lacked for much. I don’t think I ever saw a book in a bookstore when I was a kid that my parents wouldn’t buy for me if I asked. A toy? That they might deny. But I really can’t remember anything in retrospect that I felt I lacked. Maybe at the time I wished I had the Schwinn X22 bike instead of the X21, but I can’t recall it now. Recalling your “poverty,” even for the sake of telling someone an inspiring up-by-the-bootstraps story, is putting a negative spin on your memories and a cloud over your future. Don’t remember your “lacks.” If you grew up in America, chances are good (although not 100%) that your “poverty” as a child was a lack of the coolest new bellbottoms. Think forward, not backwards. Your childhood was a launchpad for who you are today. Are you improving your health, your wealth, your finances and your well-being? If so, your childhood was rich, because it gave you the tools to improve yourself now. Talking about poverty will not make you rich, ever. If you spend time telling people about what you lack, you’ll continue to lack. If you don’t want to keep lacking stuff, go out and do something about it. Don’t whine about the poverty of your youth. When you are 20 years older today, do you plan on telling people those were the lean years? I bet if you read this blog or any of the blogs in my blogroll you don’t plan on that. You PLAN on telling people that these were the years you brought the booyah. The early 2000s were when I got my shiznit together! Think about 20 years ago the same way. Even if it’s not 100% true, doesn’t it make you feel better to think that way? Listen to rich people talk about their youth. Does Sergey Brin sit around complaining about being a Jew in Russia as a child, and having to emigrate when he was 6 years old? Two out of every three billionaires made their fortunes from scratch. 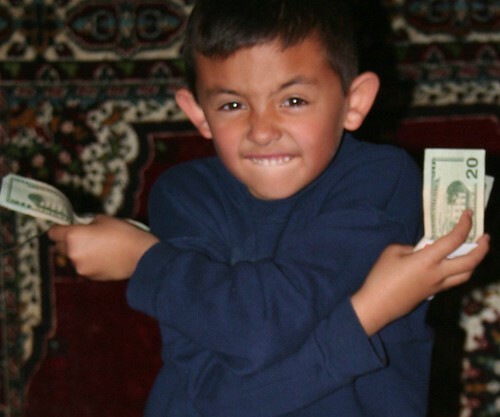 Being rich as a kid means you are LESS likely to be a billionaire. That’s an amazing thought. I try as much as I can these days to think of what I had, not what I lacked. Concentrating on the things you didn’t have then, or don’t have now, is a sure way to be miserable. When I tell my friends about my childhood they don’t believe me! I think it’s funny- they all think I came from a middle class background like they did, and in some ways I did, although we were terribly poor. I think that it is important to note the difference between *situational* poverty and *generational* poverty here. You and I are both products of situational poverty, which I think raises our chances of getting out of it- ie- we both come from backgrounds where our parents were educated people and my mother came from an upper middle class family too (I’ll bet that your PhD dad did as well) so we had no ingrained poverty issues to deal with, and we never did “think poor” (book buying on demand? my mom did that too!). This is a huge advantage over people who come from families that have been poor for generations and thoughts of poverty are woven into every aspect of family life. Oh great post. I read through a really bizarre comments thread a couple of weeks ago where people were chest thumpingly claiming that they (they personally!) had risen above and pulled-themselves-up-by-their-bootstraps just like all real Murkins gosh darn it – because their grandparents were poor kids. I’m not immune, of course, but have a husband who’s prone to dropping sentences like “well they didn’t have phones in my village until I was 13” and “well there was a civil war on at the time, so my parents couldn’t do that” which shuts me up quick smart. An imagine, you could stop the next generation’s whining and get elected by a landslide by running on a “Wii for every family” platform somewhere. @guinness416, @plonkee: Oh, well, I should have added that when I’m 80 I’m going to tell everyone that I never had a subatomic nuclear drive in MY car and we had to walk 8 miles uphill each way to school and eat beans 6 days a week. That’s definitely a privilege of old age! @Curmudgeon: You boiled it down to the key point there. @escapee: Interesting point. None of my parents’ parents were “poor” in the classic sense, although one of my grandfathers had a limited education and certainly came from a fairly impoverished community (Pennsylvania-Dutch). But you’re right – none of them had a “poor” mindset in the sense that nobody had the ingrained expectation of poverty. Maybe they didn’t dream of wealth, exactly, but they certainly expected the comfortable middle-class lifestyle. I think there’s something to this. I’ve met many smart, capable people who wanted to be wealthy, or at least well-off, yet had no idea how to achieve that goal. Well, you’re not going to find the answer in your past, especially if that past isn’t comprised of wealth. You don’t get this type of answer through past experience, but rather by taking leaps of faith. Great post. Poverty is really relative in some instances isn’t it? If you want to compare yourself to others you can always find someone who had more than you as a kid but so what? It’s not what you have but what you do with what you’ve got. @FFB: Right – poverty is a mindset more than a state. I know rich people who struggle with their bills and poorer people who don’t – it’s attitude and mindset and approach. @dawn: Dwelling on the past (even if it’s a happy past) won’t get you ahead in the future. I think happy people look forward, and look forward positively. @Asithi: My mom tells a funny story about how I embarrassed her as a little kid by telling a neighbor that we didn’t have meat for dinner at the end of the month because we were poor. But at the same time, you’re right – any of us who are in a good situation today can ultimately look back on the past and say “hey, that’s what got me HERE” – and that’s a powerful indicator that the past was more helpful than hurtful, right? I have always been of the frame of mind, you can’t change it – so why complain & whine about it. (Plus – I try to frame everything with a sense of appreciation and gratitude). Make money, have a good time, and help others! This is true. But when I’m old and I’ve made it, I reserve the right to say that it’s not the same as in my day to all the young people about. I’m claiming it as a privilege of being over say, 80. Plonkee – get off my lawn! I grew up poor. Not just lack of things poor. Sometimes we had to skip dinner because my dad does not get a check until the next day. Whenever I think about my childhood, I feel so unbelievely blessed with my life now. I rarely talk about my childhood, but when I do it is stop people from complaining their lack of money. I feel like most people do not understand what is the meaning of essentials. If you really do not have money, then get rid of the $100 TV bill and $60 data plan for your cellphone. I have no patience for people that mismanage their money, then complain about it, and does nothing to fix it. I think I might be going off on a tangent here. Great post – funny thing is that I have never thought this because my parents were very middle class – however they of course always talked about how poor they were – when they were kids but also when they were newly married which I find quite strange since they were both teachers and managed to buy a house + cottage. Don’t forget that every time you tell the story the distance to school gets longer, the weather gets worse and the quantity of food decreases. I have found myself talking along this line of thought to several of my friends recently. I grew up in a migrant family and it was hard. I can remember falling asleep in a walnut orchards while my parent and siblings picked walnuts. I was about 4 yrs old. They picked 100 60lbs sacks of walnuts that day. They were pay 50 cents each, I found out later when I was older. That was a great day for them. I have no regrets, I was pretty happy even though I started to help my family work the fields when I was 6 yrs old. There were no babysitters to take care of us, so we would all go out together and work as a unit, as least on weekends. My older siblings would attend school during the week. But on many afternoons, after school, my siblings would go out and help in the fields for a few hours before coming to do their homework, I myself, would later do the same thing. I believe that those experiences have helped me and made me a better person. I have alot of drive and have managed to have several business ventures and go to post graduate school. I am an inventor with a patent and have other inventions in the pipeline. I also have an interest in a restaurant. I make a decent amount of money as a professional and am still not done pursuing other ventures. All this said the one regret I have is that in many way I have tried to give my 4 children a “better” life than I experienced growing up. They in many ways did not have to work nearly as hard to get many of the luxuries in life my wife and I, worked so hard to attain. The issue is that in many ways they do not know the true worth in terms of cost. They don’t understand the first hand sacrifices to obtain the luxuries they were raised with because they themselves did not have make any sacrifices. So in some ways they have been isolated and protected from the hardships we endured. I also wonder if in someways if I have hurt them by giving so willingly without deep consideration of the long term affects. I can’t imagine that given to freely or withholding does not have some affect on an impressionable young mind. As I have pondered this, I have come to this conclusion; when I see people who come to the USA from other part of the world, especially third world countries. I see a drive and vigor and thankfulness for the new freedom and opportunities this country has to offer. Unlike many of us who have been given these same opportunities by virtue of the fact that we have had the privilege of being born here. I find these foreigners hungry for a better life that the USA can offer. A life which many of us take for granted. I can’t help but think that some how their pass experiences has driven them to achieve and reach for a much better life then they experienced in their homelands. Thus, I believe it is a fine line to walk with our children, to in still within them an understanding and gratefulness and appreciation for this great land of opportunity we live in. So in many ways I can really relate to what your saying. @Al: That’s a tremendous comment. It is still true that the US offers unparalleled opportunities for newcomers, and (despite what many think) even for people who grew up here. The possibilities for economic growth are still far better than most parts of the world. Pingback: Queercents » Blog Archive » Queercents Weekly Roundup: Now With A Drag Queen! About the 6:th paragraph. You say that is higher probability to become a millionaire when you are poor in your youth. That logic is flawed. First of all, imagine all the people who have millionaires as parents. It’s very likely that they will actually become millionaires (inheritance) as adults. To get proper stats of this, you should separate inherited fortune to eared fortune, otherwise it’s just going to give you flawed stats. I do not disagree with the theory that ‘poor’ kids do actually have a greater chance of making (big) money in the future, au de contraire, I do think it’s very likely. Anyways, nice post, I enjoyed reading it. @stltskn: I don’t think the logic is flawed, exactly, but I certainly don’t back it up with statistics (other than those in the dated Millionaire Next Door). I don’t think, though, that children of millionaires are likely to become millionaires in any higher proportion than others. I think you have to be in the superwealthy class to guarantee the transfer of wealth – $1 million is not going to make your kids rich, especially if you have several. But thanks, I’m glad you liked the post!! Previous PostPrevious why be rich?